Serving one’s country in the military can and should always be seen as a noble service, a service higher than one’s own self. 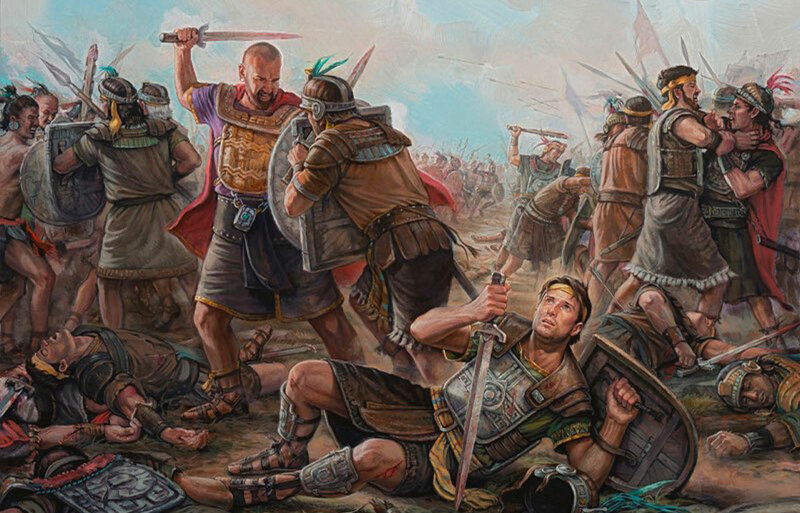 Many ancient prophets righteously led soldiers in necessary battles: Moses, Joshua, King Benjamin, Alma the Younger, and of course Mormon, the complier of the Book of Mormon.1 Additionally, many apostles and other general authorities of The Church of Jesus Christ of Latter-day Saints have honorably served in the military. Studying the lives and examples of these warrior-prophets and leaders can provide peace and meaning to those who are currently involved in military service and to their loved ones. 1. Exodus 17:8–16; Joshua 6; Words of Mormon 1:13; Alma 2:16; Mormon 5:1. 2. Kent P. Jackson, “War and Peace—Lessons From the Upper Room” in To Save the Lost: An Easter Celebration, eds. Richard Neitzel Holzapfel and Kent P. Jackson (Provo, UT: Religious Studies Center Brigham Young University, 2009), 56. 3. Message of the First Presidency, Conference Report, April 1942, 94. 4. Lance B. Wickman, “Today,” Ensign, May 2008, 103, online at lds.org. 9. Anathea Portier-Young, “Drinking the Cup of Horror and Gnawing on Its Shards: Biblical Theology Through Biblical Violence, Not Around It,” in Biblical Theologies, ed. Heinrich Assel, Stefan Beyerle, and Christfried Böttrich (Tübingen: Mohr Siebeck, 2012), 407. 10. Portier-Young, “Drinking the Cup of Horror,” 407. 11. Boyd K. Packer, “The Member and the Military,” Conference Report, April 1968, 35.